WWII Quarterly Magazine Editor Flint Whitlock recalls his experiences visiting the beaches on the 70th Anniversary of the D-Day invasion. This year I feel deeply honored to have been chosen by the Smithsonian Institution to lead three 70th anniversary D-Day trips to England and France (one took place in May; the other two were scheduled to take place in September and October). I say this not to brag but to express how humbled I am to be entrusted with accompanying small groups (about 25 per trip) and sharing my knowledge of Operation Overlord with people who have a fascination about one of the pivotal battles of World War II. While I have spent many years reading and writing about the war and about Overlord, it’s easy (and wrong) for me to assume that most people are as familiar with the operation as I am. But when I explain the operation while standing on the sands of Omaha Beach, or at Pegasus Bridge or La Fière, or the cratered, clifftop battlefield at Pointe-du-Hoc, or the quaint streets of Sainte-Mère-Église, and I see the look of amazement and sudden understanding in the eyes of my group, I get all the more excited. 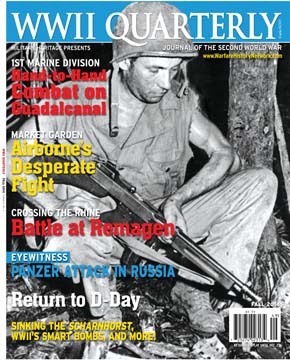 This article was published in the Fall 2014 edition of WWII Quarterly Magazine. Pick up your copy today! I tell them that all the books and films about the D-Day invasion cannot compare with actually being there—that to understand the battle, they must walk the battlefield. In their minds’ eyes, they begin to experience for the first time the operation that they have heard so much about for so long. They are actually touring Winston Churchill’s bunker and the Cabinet War Rooms beneath central London, left in virtually the exact condition they were in when the lights were turned out at war’s end in 1945. They are visiting the once super-secret facilities at Bletchley Park, where the German diplomatic and military “Enigma” codes were broken, enabling the Allies to read the enemy’s mind. They are walking on the very same decks and exploring the innards of the British cruiser HMS Belfast, whose guns fired some of the first shots on D-Day. They are viewing the same huge, wall-sized map of England and France that Eisenhower and his generals and admirals viewed at Southwick House as they tracked the progress of the great flotilla that crossed the English Channel and launched The Great Crusade. They are exploring the battered, shattered concrete casemates that held the German guns—and gunners, who must have gulped at the sight of thousands of warships bringing death straight for them. They are standing in small town squares that were once the place of ferocious fighting, crossing bridges that once ran red with blood, standing in fields that witnessed tremendous courage and carnage, walking on the same sands and stones that were once carpeted with dead and wounded soldiers who came to liberate a continent and a people they didn’t know. They are walking on hallowed ground. They are walking the rows after rows of well-tended German, British, and American graves that silently speak more eloquently than any words about the tremendous toll that war exacts on the young men (and women) of nations engaged in violent conflict. And I presume everyone else does, too. Tags battlefield, Bletchley Park, d day invasion, D-Day, Dwight D. Eisenhower, Enigma code, France, HMS Belfast, La Fiere, omaha beach, Operation Overlord, Pegasus Bridge, Pointe Du Hoc, Sainte Mere Eglise, Smithsonian, The Longest Day, Winston Churchill. I agree with you wholeheartedly. Walking the beaches or just standing on top of the hill where the American cemetery is and looking out over the beach out into the water gives one an awe inspiring feeling. It is impossible to truly know or feel what happened but there is a feeling you get a picture in your mind that is hard to get from any book or movie. My wife and I stayed at the b&b at la fiere. I would get up early to watch the mist form over the fields and watch the mederet flow under the bridge. The utter tranquility and peace that exists now in comparison to what was a truly brutal small arms battle for a bridge that as you stand on it and look down the road was at the time a very important victory and now it has returned to being a small bridge over a small river in the Norman countryside. The owner of the b&b sent me a picture of the mederet in the winter when it naturally floods the surrounding countryside it is a beautiful site to see now but it also gave me another view of how difficult and heroic it was for these men to do their job. I visited the beaches several years ago with my son Josh. Originally from NC where the difference in high and low tides is 30 ft, I never truly grasped the full depth of what our troops went through that historic morning. I stood on Dog White, Verville draw at 6:37 am, the same time the Bedford Boys hit the beach. In total awe, respect, and admiration, I took in the 500+ yards of beach our boys had to cover! with weapons in hand that would not even reach the beach wall with any effectiveness. Tears filled my eyes as I said a silent prayer for the same courage and tenacity for our troops today. A truly awesome and awakening experience.